In February 2005, my mother-in-law died unexpectedly. In the course of straightening up her house, throwing out the trash stuff and generally organizing things prior to inheritance distribution and selling, one of my brothers-in-law came across some storage boxes of fabric scraps. I was quite touched when I was asked if I would be interested in looking through the boxes to see if there was anything I would like. My mother-in-law sewed quite a bit when her sons were very small (she would make them matching shirts and then take the obligatory "stair step" picture ..... 5 boys, each 2 years apart). She also made a number of pants outfits and dresses for herself over the years. Other scraps yielded two purple prints: one a monochromatic stripe and the other a dotted swiss. 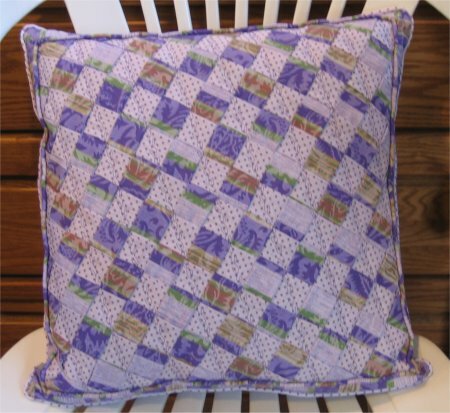 Neither were exactly of my taste but seeing as they were purple and Lisa (Lavendar Lisa) likes lavendar/purple, I thought she might like a throw pillow made from Grandma's scraps, as a remembrance. I was right. (It's nice being right). I had just returned from a very small quilt show (it was mainly vendors) and one of the items I bought was a set of FasTurn tubes. This is a product that makes turning tubes extremely easy. I've known about them for a long time but never bought them .. until now. I also bought a project book using the tubes. One of the projects was a very nice throw pillow using flat tubes made from two different fabrics and then woven to make the pillow front. The tubes were then stitched down and secured by lines of decorative stitching. It occurred to me that this would be an ideal throw pillow for Lisa. Putting aside the quilting projects I was currently working on, I made the flat tubes and wove them together in the largest square/diamond that I could from the length of tubes that I had made. This turned out to be a 12" square. I made piping to go around the perimeter of the pillow because I like the look of a piped seam. So, I could either make my own 12" pillow form .. another project I really didn't want to do. OR I could put a border around the woven tubes to increase the pillow top to be 14". The second option was just a whole lot easier and is, in fact, what I did. Since I still wanted a piped seamline, I made MORE piping and sewed another round of it around the new edges. It made a rather interesting sort of effect ... two concentric squared-off circles of piping. Lisa is very happy to have this throw pillow made from her Grandma's fabric. I'm glad to have started and finished this project in such short order.